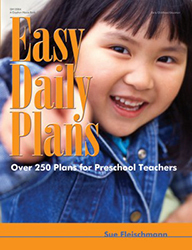 Easy Daily Plans has everything a teacher needs for a complete year's worth of daily plans! Organized by month, this great grab-and-use curriculum has over 250 daily plans that teachers can use to plan fun and enriching activities for young children. The beginning of each chapter lists month-long celebrations, week-long celebrations, holidays, and significant dates to help with planning. Add energy and excitement to the classroom using the unique ideas in Easy Daily Plans.